WhoisXmlApi is on a Bulk Roll! Regular users of WhoisXmlApi must have surely noticed a lot of product innovations and updates from our end in the past few months. These updates stay true to our commitment to delivering the most comprehensive domain name data research products & services to our valued customers. We have now released a major revision to our popular Bulk Whois Lookup, in order to ensure a seamless research experience. Our manual Bulk Whois Lookup has been one of the favorite tools for researching and investigating domains in huge quantities. To take it forward we have now introduced Bulk Whois API and Bulk Whois Web App that can further simplify your domain data research. Many times professionals need domain Whois records in bulk. Though the manual lookup provided bulk parsed data in a downloadable format, a lot of times this data needs to be clubbed further for analysis. This insight resulted in us creating Bulk Whois API service so as to reduce your effort! 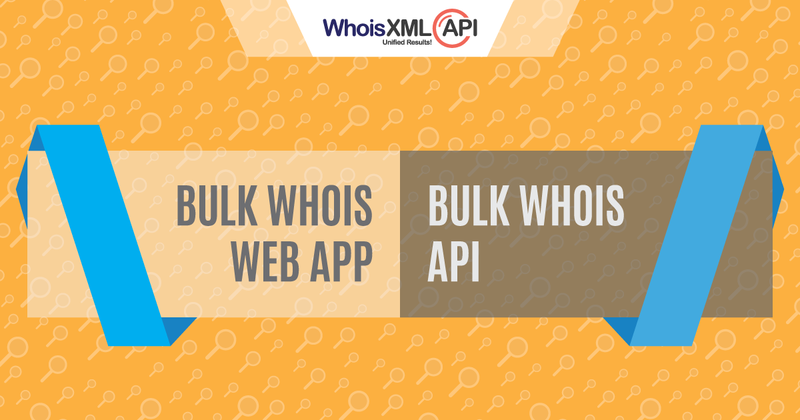 Bulk Whois API provides Whois records for a bulk list of Domains via a single API query. Firstly and most importantly, when Whois records are needed for a lot of domains in an automated fashion then Bulk Whois API is a much better option as compared to calling for a single API query each time for every domain name. With a single Bulk query request, you can call for millions of domain Whois records in one go. We don’t have any restrictions, in terms of, the number of Whois records that can be included in the request. Our advanced Bulk collector parses approximately 200 domain Whois records/ sec. thereby resulting in you getting the best data super-fast. Our System is built on the latest big data technologies, which is not only really fast but also very scalable. Since your system is integrated with our API, you need not spend time in first getting the data and then feeding the same in your system. The entire process is automated for your benefit. Usually, when you call for Whois records in bulk, you need to wait for all the data to be sourced and provided to you. With WhoisXmlApi Bulk Whois API, after your request is sent, you get a request ID back, using which you can keep calling the APIs again and again to collect what ever is ready to be fetched at that time. This way your system is not blocked and doesn’t have to process all the results at the same time. Your data can be accessed anytime. You don’t need to make the same domain name request again. You can very easily check your request status ie how much data is processed and how much is remaining to be processed. All the data provided is well parsed and real-time. For further details, please click on the link below. Bulk Whois Web-App is a simple web user interface created by WhoisXmlApi where you can upload a .csv file containing the domain names and access Whois records for the entire list at your convenience. Not everyone wants to run internal software’s to call Bulk Whois API, hence we have released this new web tool to get parsed Whois data in bulk. Since the backend of the Web application uses Bulk Whois API system, you avail most of the above-mentioned benefits barring system integration and automation, of course. Besides that, if you have already created a Request ID through Bulk Whois API and also need to separately download that data, you can do so with the Web app without any additional charges. Also, you can easily check the status of your request, before downloading the data. We have worked hard and created a functional and robust web-based front end to ensure easy access to data. Anyone with a browser and a Whoisxmlapi account can avail our comprehensive data quickly and effectively. Bulk Parsed Whois enables faster and more effective analysis of domain data. Various professionals require data in bulk as they are interested in learning about groups of domains, people behind domains or various connections between domains. Whether you are using Whois data for security investigations, investing in domains or simply for researching various domain trends, our Bulk Whois products will ensure you quick access to real-time, accurate and well-parsed data. At WhoisXmlapi, we are constantly trying to make our users’ experience better. And hopefully, with rolling out the Bulk Whois Products, we have taken another step in that direction. Do let us know what you think. We are always looking for feedbacks with your thoughts, ideas, and requests!